Corrosion resistant pressure pipe, IPS sizes 1/4" through 24", for use at temperatures up to and including 200°F. Pressure rating (130 psi to 1130 psi) varies with schedule, pipe size, and temperature. Generally resistant to most acids, bases, salts, aliphatic solutions, oxidants, and halogens. Chemical resistance data is available and should be referenced for proper material selection. Pipe exhibits excellent physical properties and flammability characteristics. Typical applications include: chemical processing, plating, high purity applications, hot and cold potable water systems, water and wastewater treatment, and other applications involving hot corrosive fluid transfer. This specification outlines minimum manufacturing requirements for Chlorinated Polyviny Chloride (CPVC) Schedule 40 & Schedule 80 iron pipe size (IPS) pressure pipe. This pipe is intended for use in applications where the fluid conveyed does not exceed 200°F. This pipe meets and or exceeds the industry standards and requirements as set forth by the American Society for Testing and Materials (ASTM) and the National Sanitation Foundation (NSF). The material used in the manufacture of the pipe shall be a rigid chlorinated polyvinyl chloride (CPVC) compound, Type IV Grade 1, with a Cell Classification of 23447 as defined in ASTM D1784. This compound shall be light gray in color as specified, and shall be approved by NSF use with potable water. CPVC Schedule 40 & Schedule 80 pipe shall be manufactured in strict accordance to the requirements of ASTM F441 for physical dimensions and tolerances. 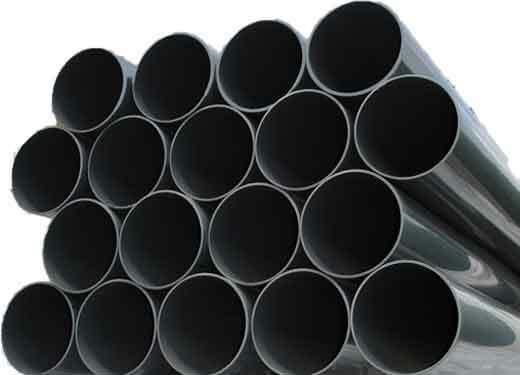 Each production run of pipe manufactured in compliance to this standard, shall also meet or exceed the test requirements for materials, workmanship, burst pressure, flattening, and extrusion quality defined in ASTM F441. All belled-end pipe shall have tapered sockets to create an interference type fit, which meet or exceed the dimensional requirements and the minimum socket length for pressure-type sockets as defined in ASTM D2672. This pipe shall have a flame spread rating of < 25 and a Smoke Development rating of < 50 when tested for surface burning characteristics in accordance with CAN/ULC-S102-2-M88 or equivalent. EXAMPLE: 10" CPVC SCHEDULE 80 @ 120°F = ? THE MAXIMUM SERIVCE TEMPERATURE FOR CPVC IS 200°F. Threading of Schedule 40 CPVC pipe is not a recommended practice due to insufficient wall thickness. Thread only Schedule 80 or heavier walls. Threading requires a 50% reduction in pressure rating stated for plain end pipe @ 73°F. This specification is applicable to fabricated fittings, as constructed by Harrison Machine & Plastic Corporation, as they pertain to (CPVC) Chlorinated Polyvinyl Chloride Schedule 40 & Schedule 80 fitting configurations. Fittings are to be manufactured from CPVC material which meets or exceeds the requirements of ASTM D-1784, Type IV, Grade 1, cell classification 23447B. Pressure pipe used in fabrication must conform to ASTM D-441 and listed by the National Sanitation Foundation (NSF) for potable water applications. Sheet stock material (where used) must conform to ASTM D-1784, cell classification 23447B, Type IV, Grade 1, manufactured without the use of plasticizers or fillers. Fittings are to be manufactured from CPVC material which meets or exceeds the requirements of ASTM D-1784, cell classification 23447B Type IV, Grade 1. Pressure pipe used in fabrication must conform to ASTM F-441 and listed by the National Sanitation Foundation (NSF) for potable water applications. Welding rod used in the manufacture of the above fittings, shall conform to ASTM D-1784, cell class 23447B, and shall be of a material compatible with the corresponding pipe/sheet stock. CPVC Schedule 40 & Schedule 80 fittings will be light gray in color. This color code applies to both pressure and drainage patterns. All cataloged fittings to be constructed in accordance with Harrison Machine and Plastic Corporation, published drawings. Non-cataloged fittings will be furnished in accordance to or as agreed upon customer specifications. It is essential that surfaces to be cemented are clean and free of foreign material. If permitted to remain, grease, oil, ink, etc. can interfere with the solvent cementing process and reduce the strength of the bond. Large diameter joints are very similar to those for smaller diameters, in that both have tapered sockets. Tapered sockets have the capability of providing a fused joint at the socket bottom and a bonded joint at the top of the socket, resulting in a quality seal particularly in pressure applications. Tapered sockets, however, also result in a situation where the pipe will tend to "push-out" immediately after the pipe is inserted into the fitting socket. Care must be taken to hold the pipe in place until the cement begins to set. As with any solvent cemented joints, the pipe must be cut square and cleaned. Large diameter CPVC pipe may be cut with a skill-saw and a carbide tipped blade. A circular blade with 20 or less teeth is preferred over a finer blade with tends to heat the CPVC material as it cuts, resulting in a molten CPVC residue producing a rough cut. The use of a "pipe-belt" is recommended to ensure a straight cut. At this point, available manpower working in unison, is used to keep all components in place. Be sure the pipe & fitting are free to travel the required distance to seat at the fitting socket bottom. Mark the depth of the socket on the pipe, plus six inches, as an indication of pipe insertion depth. The two cable come-alongs are immediately hooked up at 3:00 and 9:00, so that after application of primer and solvent the joint may be pulled togeher. Using Cleaner, clean pipe and fitting surfaces with a cotton rag to remove any moisture and excessive dirt. After properly cleaning pipe surfaces, using Primer and a 3" to 4" wide brush, liberally apply the primer so that it flows on to and soaks into the plastic, resulting in a softening of the surfaces for maximum weldability. The primer should be applied to the pipe ends and to an area equal to the corresponding fitting socket depth plus approximately 4 inches. The primer will remove the glossy surface, dirt and surface printing. A properly primed surface will have a uniform dull surface which will beging to soften. Using Heavy Bodied Cement, liberally apply the solvent, again using a 3" to 4" brush, to both the fitting socket and pipe surface. Do not overbrush the solvent. When done properly, very little of the surface areas, to be joined should be visible A thick even coat is needed to fill the gap between pipe & fitting. Note: It may be advisable to pur the primer and solvent into larger "wide-mouth" containers, prior to use to accomodate the 3" to 4" brushes.